Pavers, whether brick, concrete, or stone, can give that elegant and sophisticated look to any outdoor space. Decorative concrete has made it possible to acquire the same look with fewer complications. 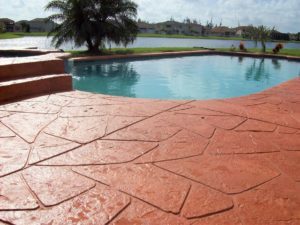 If you are having two minds about whether decorative stamped concrete is a choice you won’t regret, here are six reasons why concrete stamping is a more favorable option for you. It may not be a huge difference in cost but a few dollars cheaper means a lot. Concrete overlays can be applied on existing concrete; this means you won’t have to tear old concrete out just to make way for new material. Also, concrete stamping requires a simpler process than having to install individual units of pavers. This is ideal for home and business owners who want a budget-friendly but highly decorative and functional upgrade on their floors. Pavers come in pre-colored units. This means your color choices are limited. Stamped surfaces, on the other hand, can be stained into custom colors and designs. A stamped concrete contractor can even mimic the random colors of natural stone. A concrete overlay can be stamped in a wide range of patterns. You can choose from ashlar, herringbone, cobblestone, brick, basket, flagstone, palo verde, and a lot more. You can even have contrasting patterns on one surface. Settling is when dips and bulges appear on a paver floor of a residential or commercial property. This is often caused by loose or moving soil underneath. Although pavers are tamped to squeeze it in place, an unprepared layer underneath it could still cause it to settle unevenly. Stamped concrete, on the other hand, is an overlay applied on an existing concrete slab so settling will not be an issue. Pavers often have gaps in between each piece. Even though these are filled with coarse sand or stone dust, there is a possibility for weed to grow in them. Also, sand can be washed away by wind or rain, so a refilling is required to keep those gaps filled. This means it requires more maintenance than a stamped concrete floor, which only requires basic cleaning efforts. Unlike pavers, stamped concrete can be used indoors. The most common is on the kitchen floor. Its textured surface and decorative appearance makes it an attractive element while keeping it safe from slips and falls.